The Abu Sayyaf, a small group of Islamic militants, killed the man. PHILIPPINE AUTHORITIES HAVE confirmed that Muslim extremist guerrillas had beheaded a second Canadian hostage, as they defended their inability to save him despite months of pursuit. 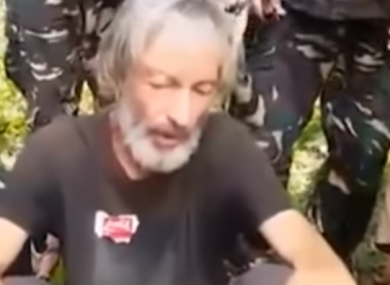 The Abu Sayyaf, a small group of Islamic militants based on remote and mountainous southern islands that specialises in kidnappings-for-ransom, killed Robert Hall after its demands for 300 million pesos (€6.2 million) by yesterday were not met. “We strongly condemn the brutal and senseless murder of Mr Robert Hall, a Canadian national, after being held captive by the Abu Sayyaf group in Sulu for the past nine months,” presidential spokesman Herminio Coloma said in a statement. A military statement confirmed that a severed head, believed to be Hall’s, was found near a cathedral on Jolo, the main island in the Sulu archipelago that is one of the Abu Sayyaf’s strongholds. In announcing on last night that he feared Hall had been killed, Canadian Prime Minister Justin Trudeau expressed outrage while maintaining that ransoms should not be paid. “The vicious and brutal actions of the hostage-takers have led to a needless death. Canada holds the terrorist group who took him hostage fully responsible for this cold-blooded and senseless murder,” Trudeau said. Hall, a retiree, was among four people abducted last September from aboard yachts at a tourist resort on Samal island, about 500 kilometres to the west of Sulu. Another Canadian kidnapped with him, John Ridsdel, was beheaded in April after a similar ransom demand of 300 million pesos was not paid. The fates of the two other people abducted at the Samal resort – Hall’s Filipina girlfriend Marites Flor and Norwegian resort manager Kjartan Sekkingstad – remain unknown, but the Abu Sayyaf had also previously demanded ransoms for them. From 2002-2014, the US deployed special forces in the southern Philippines to train Filipino troops to combat the Abu Sayyaf, a move which led to the killing or arrest of many Abu Sayyaf leaders. But the Abu Sayyaf went on a sustained kidnapping spree after the Americans left. It has abducted 44 Filipinos and foreigners since the beginning of last year, according to Pacific Strategies and Assessments (PSA), a security intelligence group. Most have been released after ransoms were paid, although it is still believed to be holding at least eight people including a Dutch bird watcher abducted in 2012. Email “Islamist guerillas behead hostage in the Philippines”. Feedback on “Islamist guerillas behead hostage in the Philippines”.